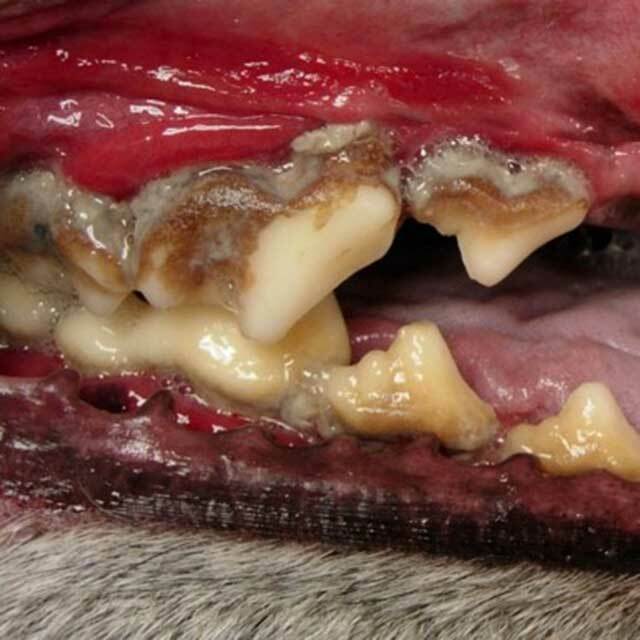 Gum disease is the same in cats and dogs as it is in people. Gum disease is an infection resulting from build-up of soft dental plaque on the surfaces of the teeth around the gums. The bacteria in dental plaque irritate the gum tissue. If plaque is allowed to accumulate it can lead to infection in the bone surrounding the teeth. Other oral health issues may involve missing, broken or malformed teeth, lesions, jaw alignment and bite problems. Chronic infection in the oral cavity can spread harmful bacteria to the bloodstream and infect the heart, lungs, liver and kidneys. 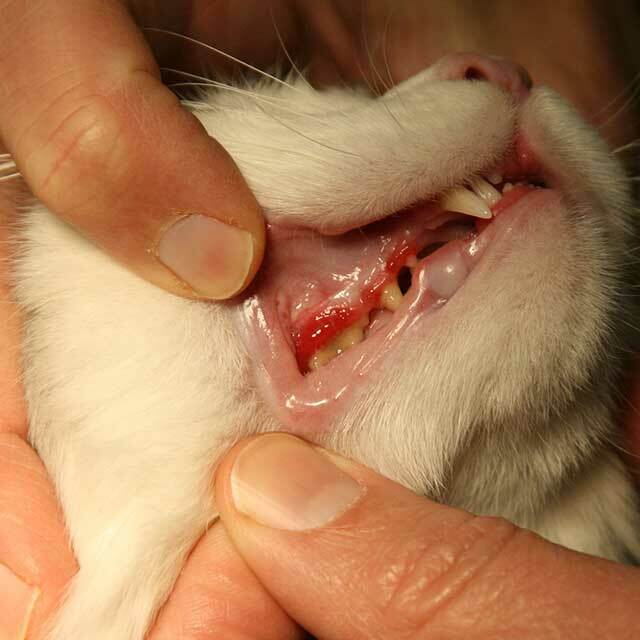 We perform a complete oral exam on your pet as part of the annual physical exam. During a dental check-up, your pet's teeth will be examined for cavities, root exposure, tartar, and any sign of loose or cracked teeth. In addition, the gums will be examined for any sign of disease or inflammation. At that time, we make recommendations regarding the oral care that your pet needs, and in what time frame the procedure should be completed. Lost or loose teeth or teeth that are discolored or covered in tartar. 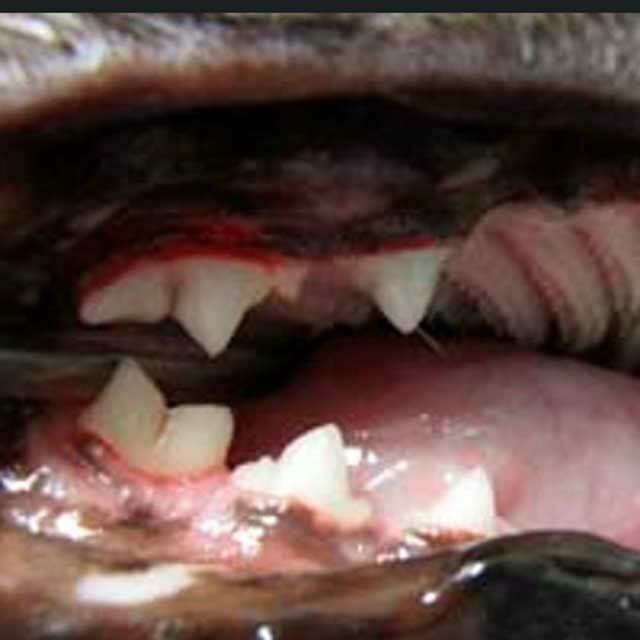 Your pet shies away from you when touch the mouth area. Abnormal drooling, dropping food from the mouth, or swallowing food whole. Other changes in eating or chewing habits. Pawing at the face or mouth. Dental prophylaxis is done under general anesthesia. In addition to the benefit of being able to physically perform the procedures, this prevents your pet from inhaling bacteria. Although anesthesia is never risk free, we take every precaution to minimize risk, including pre-anesthetic blood screens. Your pet is monitored while under anesthesia. We may prescribe antibiotics before, during, and/or after the procedure. Dental scaling removes accumulated calculus and plaque. Often harmful debris must be removed from below the gum line by using instruments to curette the deep soft tissue adjacent to the tooth, or to plane the deep root of the tooth itself. A great deal of dental disease occurs below the gum line, and can't be seen on an oral exam. Every patient undergoing a dental prophylaxis (dental cleaning) will have dental x-rays taken, as well as "before: and "after" images. 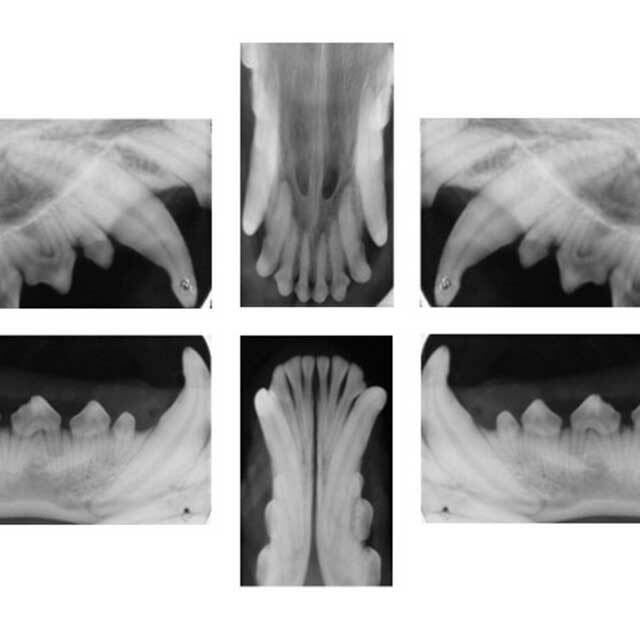 Using these radiographic images, we can spot root abscesses, fractures, broken teeth, tumors and lesions. This allows us to devise a treatment plan appropriate for any conditions found. If single or multiple tooth extractions are necessary, we will usually do the extraction procedure during the dental. If the tooth has a cavity, is broken, or is no longer held firmly in place by surrounding bone it is painful and needs to be extracted. The final step, polishing and rinsing, smooths the tooth surface to delay re-occurrence and helps to flush harmful material from below the gum line. Injections for pain are administered during the dental procedure, and oral medication is often prescribed for the first few days at home. If recommended, feed soft (water soaked) or canned food. Return for follow-up as directed.